I know, I get that porridge isn’t the most thrilling thing to write about. Well, until now it wasn’t. 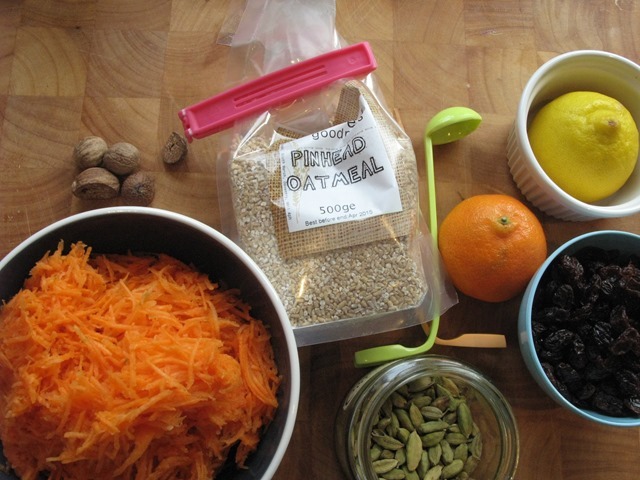 I have had my head seriously turned by an introduction to ‘pinhead’ oats, which recently made the most sensational porridge I had ever eaten, so much so that I have been making massive batches of it for about two weeks now. I’ve even converted my porridge-hating husband! I’m not talking about a saintly plain porridge recipe either – I mean, that would be mega dull to write about, wouldn’t it? This recipe is something super special – it’s like a deconstructed spiced carrot cake in breakfast format. Mmm – warm carrot cake in a bowl that you can eat with a spoon – JUST THINK ABOUT IT! For my inspiration? I looked to our American pals – they do breakfast items so very well. I got the initial recipe via Joy the Baker, who had adapted it from Megan Gordon’s Wholegrain Mornings recipe book, which has just been published in the States. I’ve tweaked the recipe a little to add my own spicing preferences and I haven’t used any cow’s milk – it’s equally amazing with coconut milk or almond milk if you’re trying to cut out the dairy products. The taste feels cleaner, to my mind, and I don’t miss that ‘claggy’ taste I sometimes get with cow’s milk. And because pinhead oats haven’t yet been flattened to make rolled oats, they hold their shape and texture really well, and taste almost ‘bouncy’. Which means you can reheat and reserve this porridge even several days later as it doesn’t stick together in a lump – a bonus for me, as I need to make breakfast in batches in advance to take to the office. You can use any spices or dried fruits that you fancy – below is just a version that you can use as a guide, and watch out, I favour ground cardamom in big quantities! 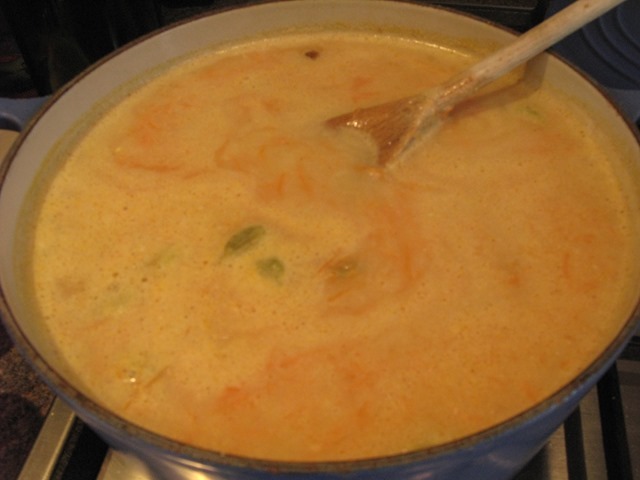 Bring the water and milk to a gentle boil in a saucepan. If you’re using cardamom pods (instead of ground) chuck them in at the beginning. 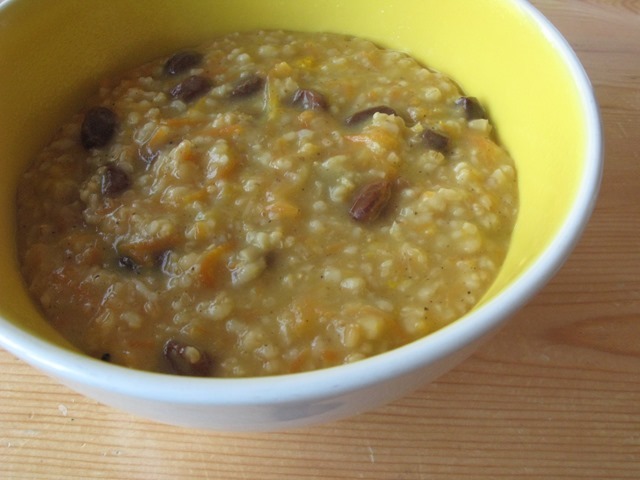 When boiling, turn the heat down to a simmer and throw in the oats, grated carrot, raisins, spices, salt and vanilla extract. Give everything a stir then simmer away, covered with the lid, for about 30 minutes – give everything a stir a couple of times to make sure nothing is sticking to the bottom of the pan. 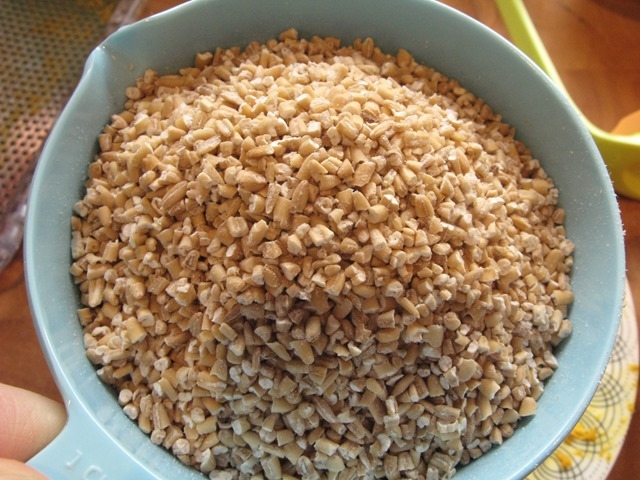 The oats should absorb most of the liquid and the texture should be fairly soft and runny. Turn the heat off and keep the lid on for five minutes. Then, just before serving, mix in the lemon zest and add the sugar to taste. Add a bit more milk to your bowl if you like. 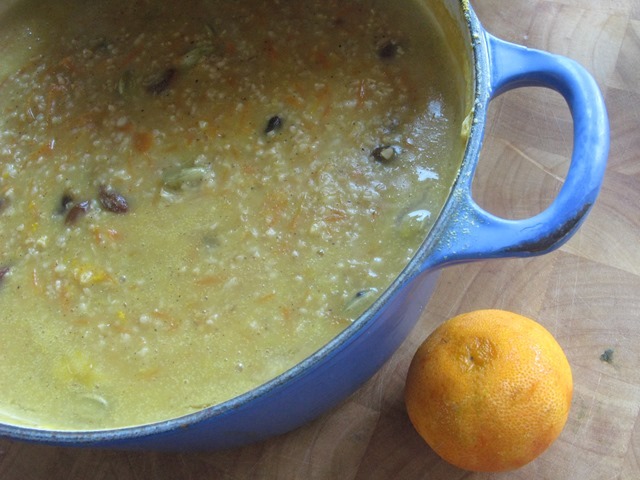 If you have leftovers, this porridge tastes really good cold, especially if you’ve made it with coconut milk – it becomes like a creamy rice pudding! Add a bit of extra milk to it when you serve it up again, never hurts.